The simple explanation for the declining replacement rate is that household earnings are much higher when both spouses are working, but their Social Security pension benefits do not increase proportionally. The reason is that even if a wife doesn’t work, she still receives a spousal benefit equal to half of her husband’s benefit. The more a working wife earns, the lower the couple’s replacement rate. 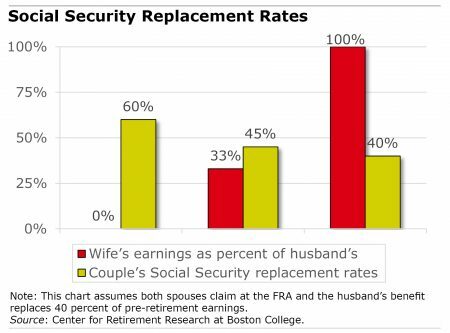 The chart below shows how replacement rates vary for three different types of married couples, all retiring at the program’s full retirement age. In the left column is the traditional 1930s couple with a non-working wife. The other columns show more modern couples in which wives work and their lifetime earnings equal 33 percent or 100 percent of their husband’s lifetime earnings. The example assumes that the husband’s benefit replaces 40 percent of his previous earnings from working. To get the replacement rate for a traditional couple with a non-working wife, add his 40 percent to her spousal benefit, which equals 20 percent for a combined replacement rate of 60 percent of his earnings. Now consider the case of a working wife whose lifetime earnings are 33 percent of his lifetime earnings. 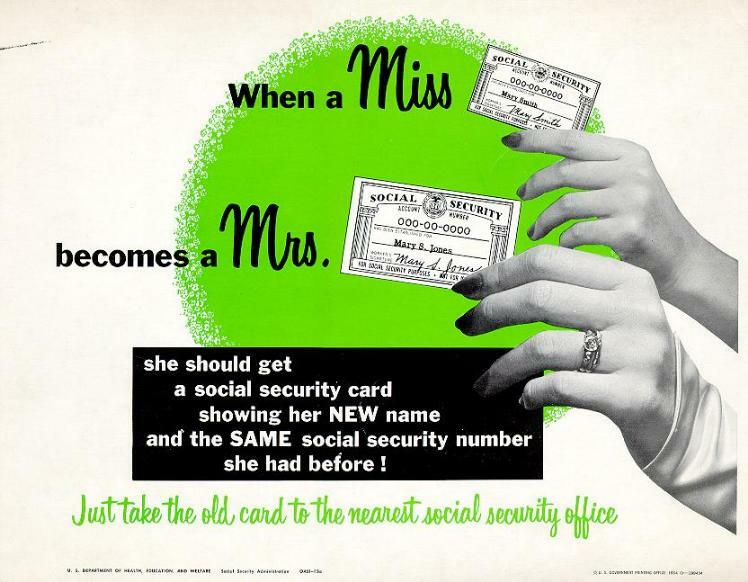 Under Social Security’s formula, her benefit is still equal to half of her husband’s. But the couple’s replacement rate falls to 45 percent, because their combined pre-retirement earnings are higher than the couple in which the wife doesn’t work. In the far right column, the wife earns as much as her husband and receives a benefit based on her own work history – and doesn’t receive a spousal benefit. Social Security replaces 40 percent of each spouse’s pre-retirement earnings and 40 percent of their combined earnings. Social Security is essential to Americans’ retirement security. But the prevalence of women in the labor force today has diminished its importance to most married couples and can have a big impact on their retirement planning. The solution to the problem mentioned in this article — which most people aren’t complaining about, by the way — might be to get rid of Social Security’s progressive distribution formula, such that individuals receive back an amount based directly on what they paid in – similar to most (if not all) other types of insurance. If distributions were always directly correlated to contributions (by some set percentage), the income replacement percentage would always be the same, regardless of gender, income, or marital status. Rules made for those age 70 and over cannot be changed. There are still too many wives who did not work outside of the home. This was the culture, and you cannot change those facts. You are never going to receive the amount you paid in to any entitlement based system; even life insurance is a mutual-entitlement structure. The insurers need to make their margins and also preserve capital to serve all their customers. The only hope for increasing replacement income is to continue working. Or to reduce the age at which earned income is not deducted from the Social Security benefit which is currently age 66 I believe. Social Security was never designed to repay each individual for his/her past contributions; it was designed to help all elderly who had worked with a secure, “dignified” retirement. My wife and I, both of whom made decent middle class salaries, will never recover what the program cost us. Nevertheless, it suffices for the major part of our combined incomes. The columnist is looking at SS as sort of a deferred annuity, which is a poor comparison. This is the worst kind of pseudo-truth, statistical nonsense. The DOLLARS required by dual-working couples are greater now because their joint lifetime earnings are (likely far) greater than when only the husband was paying into the system. So what if the percentage is smaller? Try paying for anything with statistics: it’s the actual amount of DOLLARS that matters!! Sheesh. Ron M has it figured out, joint life expectancies are longer than single life expectancies. And also consider that women live longer than men so that provides further support as to the reduced annual rate.